When we think of lower back pain, we may think of problems in the spinal column itself. It is true that slipped lumbar discs, inflammation in the facet joints, and strains in the muscles attaching directly to the vertebrae are all common causes of back pain. But in many cases, pain radiates to the back from the pelvic region. Problems in this area can also cause pain, tingling, or numbness further down the leg, so it is important for patients to understand the importance of maintaining the health of the muscles in their gluteal region. An examination will be necessary to diagnose whether a patient’s lower back pain is due to muscle inflammation. Pain from sciatica can reach as far as the foot. Problems at the hip-level involving the gluteus minimus and medius may be felt in the leg. As part of the examination, patients will be put through a range of motions involving different muscles. The location of the gluteal region makes it difficult for patients to massage on their own, although they may benefit from assistive devices. Common treatments include range of motion and strengthening exercises such as bridging and use of resistance bands. Patients may also benefit from deep tissue massages, use of heat or cold packs, manual manipulation, and electric muscle stimulation. Because other serious problems may feel like muscle strains, it is always advisable to seek professional help for persistent pain. If you work at a desk job, it is easy to get into bad habits that can cause worse pain than you ever imagined was possible from sitting wrong. Bad posture in the workplace can cause your joints to fall out of alignment and results in stress to your muscles and the tissues around them. When your posture is poor, your muscles weaken and your joints become less flexible. Chronic pain can occur as a result of the stress on your spine and lead to back pain and headaches. As we age, bad habits at the office such as slouching and lack of exercise during the day can cause muscle fatigue and tension. Some signs that you might have bad habits at work include rounded shoulders, a potbelly, your head leaning forward or backwards, back pain, muscle fatigue, headaches, and bent knees. With some lifestyle adjustments, you can improve your posture and spinal health. To improve your posture and back pain, you need to practice good habits at work. 1. Don’t slump or slouch at your desk; sit all the way back in your chair with your feet flat on the ground. 2. Move your shoulders back and open your chest to alleviate tension and prevent slouching. 3. Make sure your eyes are at an equal level of your computer screen so your neck isn’t tilted up or down. 4. Stand up and stretch every 30 minutes to loosen your muscles. 5. Set reminders on your phone or computer to stretch and move around. 6. Exercise regularly to keep your muscles and joints loose. 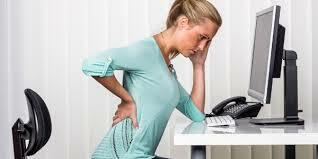 You can improve your posture and pain by seeing musculoskeletal specialists such as chiropractors. Physical therapy provides treatment and prevention of chronic conditions including back pain through different exercises. Chiropractors use different spinal manipulation techniques – including adjustments and massages, to relieve pressure on your joints, reduce inflammation, and improve nerve function. If you are still experiencing back pain with improved workplace habits, a chiropractor can conduct an examination and diagnose damage that has already occurred. In today’s society, many people are carrying around more and more things around in backpacks, briefcases, computer bags, and purses. The result — back pain. 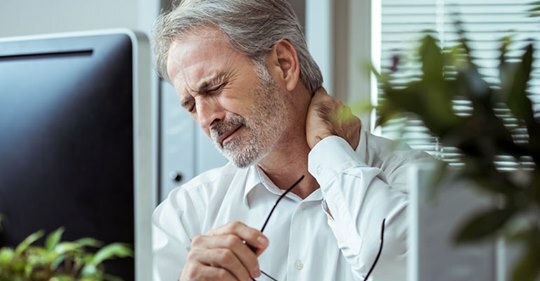 "It's an epidemic," says Scott Bautch, DC, chairman of the board and chief executive officer of Allied Health Chiropractic Centers in Wausau, Wisconsin. In fact, low back pain causes more global disability than any other condition, according to a study published in March 2014 in the Annals of Rheumatic Diseases. When Dr. Bautch talks to people about bags as a potential cause of back pain, he asks them to empty their own bags. And they pull out pounds and pounds of stuff — several water bottles, three or four books, sets of keys they thought were lost, $20 in coins. People are also carrying much more technology than ever before, from smartphones to laptops. "They seem like little things, but they all add weight," Bautch says. Pick the smallest bag you can. The bigger the bag, the more you put in it, Bautch says. Do yourself a favor and carry the smallest bag filled with only what you really need and leave the rest at home. Keep in mind that it's usually not one single item that leads to back pain symptoms, explains Bautch. More likely, it's the accumulation of smaller items, such as loads of loose change, that causes pain. Aim for symmetry. Putting extra weight on one side of your body is one of the biggest back pain causes. Any time you carry weight on one side of your body for an extended period of time, it causes your spine to curve, and that leads to back pain symptoms, Bautch says. With that in mind, it's better to choose a messenger bag that you wear diagonally across your body rather than a single-strap bag that rests on one shoulder. Switch sides. When you can't avoid using a single-strap bag, be conscious of changing the sides you use to carry it. If it's a short strap that you carry with your hand, regularly move it from your left hand to your right hand, Bautch suggests. If it's a shoulder strap, try changing it from your left shoulder to your right shoulder. Go for thick straps. A thin strap resting on your shoulder can cut into your muscles and lead to problems, Bautch cautions. Wear a backpack. Backpacks aren't just for school kids anymore. The dual straps of a backpack are the best at evenly distributing weight on your body, and that's leading more adults to use them, Bautch says. Frequent fliers are turning to carrying backpacks as a remedy for back pain. Edward Welch, president and founder of Horizonz Property Management in Atlanta, has been traveling for business about six times a year for the past eight years. After packing up books, a laptop, a work organizer, and more, he says his bag weighs at least 20 pounds when he heads for the airport, and carrying everything in a briefcase with a strap led to lower back pain. Recently, he started using a backpack, and that has helped. "I just came back from a trip and my back felt better with a backpack," he says. Keep in mind that the way you wear a backpack is key because it can change your gait, Bautch says. When you slide a backpack onto your shoulders, adjust the straps so that you carry it as high on your back as you can. The top of the backpack should be at the same level of the big bone you feel at the lowest part of your neck, Bautch says. Also, keep the straps tight so the bag is as close to your body as possible. Wearing it close means it will feel lighter, he adds. Pull a bag on wheels. Airline pilots and flight attendants used to carry single-strap bags and developed their own unique musculoskeletal problems, Bautch says. But today you see them using pull-cart bags or luggage on wheels, which helps them avoid back pain symptoms. Designate different bags for different uses. Rather than trying to carry everything in one bag, designate a briefcase for business, a gym bag for exercise clothes, another bag for your kids' items, and so on. Aim to carry less than 10 percent of your body weight. Ideally, you shouldn't carry around more than 10 percent of your body weight, so put your bag on a scale and see how it measures up. If it's too heavy, see if there's anything you can do without. The best thing you can do for your back is to be a minimalist. Don't carry what you don't have to, but when you need to take a bag with you, choose the right one and wear it the proper way to eliminate back pain causes. If you are experiencing back pain, call Lakewood Chiropractic to schedule a free, no obligation spinal exam and consultation to see if chiropractic care may help relieve your back pain. 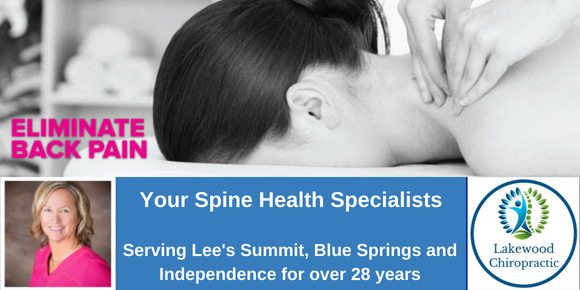 Call us at 816-373-3373 or click here to request an appointment online. The neck is a very vulnerable part of the body. Ligaments, nerves and muscles that have been injured are typically the cause of our neck pain along but poor posture or degenerative diseases can also be the culprit. Even our daily schedule can lead to common “wear and tear” on our neck and spine resulting in pain. Neck pain can spread to the head, shoulders, arms and hands. It can be acute (sharp) or chronic (repetitive). Acute neck pain begins suddenly, usually after an injury. Acute neck pain usually resolves as the injury heals, within several days or weeks, while chronic neck pain lasts longer than three months. The treatment for neck pain depends on its cause, severity and duration. The majority of neck problems are treatable with therapy, short periods of rest and adjustments. An examination is necessary to identify the cause of the neck pain and to determine the appropriate course of treatment. If you are suffering from neck pain, call our office today for a free assessment for new patients. Serious neck pain can keep you from enjoying day-to-day activities. We can help you overcome and manage neck pain so you can get back to life! With a series of non-surgical treatments you will begin to enjoy the freedom from back pain and improve you life. Decompression Therapy combined with Light Therapy is fast, effective, drug-free, and safe. This exciting technology is cleared by the FDA and available to you today. If you are experiencing pain, contact us today for a complimentary exam and consultation to determine if chiropractic care can help you. Call us at 816-373-3373 or request an appointment online. Lakewood Chiropractic is conveniently located 2 miles south of I-70 at the M-291 and Lakewood Blvd exit.